If there’s a better way of opening the year than the Music Department’s choral masterworks concert, then let’s hear it. Because there isn’t. 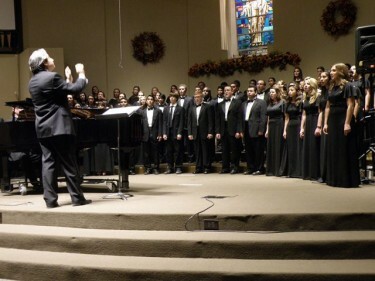 GCU’s New Life Singers, Canyon Singers and Canyon Chorale covered a stunning amount of ground Thursday night at First Southern Baptist Church adjacent to campus, offering something for a range of tastes. Rocking spirituals? Check. Tender French love songs? Check. An instrumental number? A dedication? A stylish cover of “Payphone” by Maroon 5? Check, check and (believe it or not) check. The 80-member Canyon Chorale, under the direction of Dr. Juan Hernandez, in performance Thursday night. The highlights were rich for lovers of choral music in the 90-minute concert, which drew a large crowd to the church sanctuary. It’s beginning to sound like a broken record, but the three choirs seem to have taken another step forward in their quality of performance, led by the direction of Gabe Salazar (New Life), Dr. Sheila Corley (Canyon Singers) and Dr. Juan Hernandez (Canyon Chorale). Captivating guest solos by two alumni, soprano Christina Cullers (“Ain’t It a Pretty Night”) and tenor Taylor Anderson (“Ah! Mes amis-Pour mon ame”), illustrated why both will be auditioning this weekend with the Metropolitan Opera National Council. Those bookended seven terrific selections from the 24-member Canyon Singers, including two songs in French, a dedication from Corley to her husband, Ken (“Long Road” by Erik Esenvalds), and the spiritual “John the Revelator.” The latter piece featured some spectacular piano work from longtime accompanist Mark Fearey, now a full-time GCU faculty member. Finally, the 80-member Chorale put an exclamation point on its five selections with J.N. Beck‘s rousing “Canticle of Praise.” The familiar “Canon in D” by Johann Pachelbel was inserted into the middle of the set, giving the new instrumental music program some recognition with Ricardo Laborin on marimba and Matt Tucker playing guitar. The performance marked the start of a busy season for the choirs, which will be part of “Handel’s Messiah” on Dec. 7 in GCU Arena and then perform their annual Christmas concert on Dec. 11 at the church.